Haven't really done justice to Germany. I have been there a few times on business usually landing and taking off in darkness. See if you can get a smile out of passport control at Frankfurt. I couldn't. Now, for a recent update. 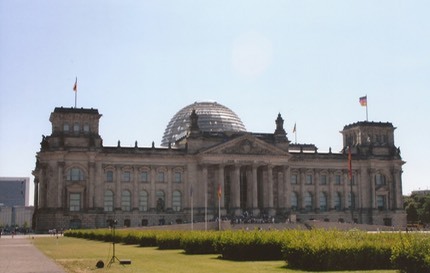 We went to Berlin in 2010 for a long weekend. It turned out to be one of the hottest ever weekends in that area. We stayed in the old eastern side of the city in a lovely boutique hotel. 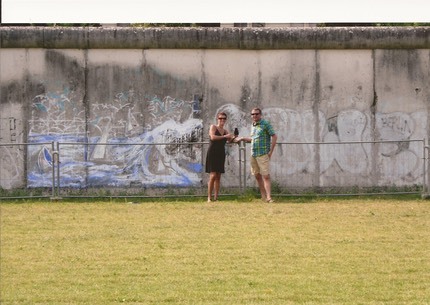 For a first visit we followed the time honoured route of the wall, Hitler's bunker site, Checkpoint Charlie and so on. We were there for the world cup semi-final with Germany which was a good way to spend a Saturday night. Below the Reichstag.